NEWS CENTER MAINE PORTRAITS is a series created to spotlight what it means to be a "Mainer." We are excited to introduce you to Mainers that have a special bond with this great state we call home. Meet Jason Johnston. Maine has an uncanny ability to convince those who leave to return. That's the case for Jason of Westfield who found his dream job in Aroostook County after leaving home for school. He's now living where he wants, doing what he loves and running his own business that's flourishing. Share this story to celebrate our Maine connections! Johnston completed his primary and secondary education in Presque Isle before attending Bowdoin College in Brunswick, where he earned his bachelor's degree in biology and environmental studies. Upon graduation, he left Maine to earn a master's degree in entomology and applied ecology at the University of Delaware in Newark, Delaware. Knowing he wanted to be back in Maine or a place like Maine, and that he liked the combination of teaching, researching and interacting with students, all while understanding the drawback of narrowing his job options, Johnston returned to Maine to acquire a Ph.D. at the University of Maine. In his final year of the program, Johnston began relentlessly searching for job openings. "I remember the day, it was like 4:30 [p.m.], I looked at the job posting and there was an ad for the University of Maine at Presque Isle — wildlife ecologist," he said. "I called my wife immediately. It described all of my abilities and, of course, being from Presque Isle, I was pretty happy to have that opportunity." Johnston is now a professor of biology at UMPI and an ornithologist for the National Science Foundation studying migration changes to birds in the north woods of Maine. 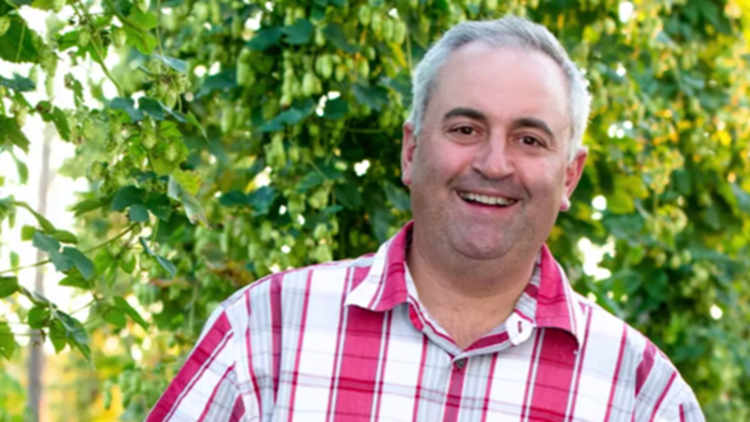 Johnston and his wife Krista started growing hops as a hobby in 2008. The company they started in 2009, Aroostook Hops, now supplies many of the great breweries with locally grown hops. Their four-acre farm includes 25-foot poles sticking 18 feet out of the ground with cables strung above creating a gridwork of hops growing material. Johnston said it combines a lot of technical knowledge and hands-on ability. He said you also have to know about every aspect of growing a plant successfully and preventing insects, disease and other threats to the plant so you're able to produce as much of it as possible. "[It's] an ambitious undertaking to say the least," he said. "But it's enjoyable and we keep at it and we're committed … we're in it for the long haul." Johnston said there a lot of breweries that actually rely solely on Aroostook Hops, and that many others buy hops from the company. He sees a lot of opportunity for agriculture in Aroostook County, a region that has continued to support potato crop harvesting for generations, to succeed. He said UMPI plans to soon offer a bachelor's in agriculture. "You have to connect with the place that you live. We have land, we have significant local infrastructure and expertise. We have markets that are pretty close," Johnston said. "I've had a lot of conversations with people who are really excited about the future of agriculture and opportunities to grow the economy here. And when you grow the economy you definitely strengthen those communities." Johnston said one of his family's mantras has always been work hard, play hard. "I think that embodies a lot of people in The County," he said. "Work hard during the week and maybe on Saturday morning and then have time for family and doing fun things on the lake and in the woods." Johnston said one of the long-standing values of the region has been its extremely strong work ethic, one that includes helping people out. "Because it's an [agriculture] community, farmers down the road help other farmers, and even now with much bigger farmers you still feel that sense of people helping other people out," he said. "This is a great place to be."